Hugo Blanjoue and his KTM colleague Thomas Dubost are not only riding in the same KTM-team, but both are also personally good friends and fight against each other only in the special-tests: this time Blanjoue was 23 seconds ahead after nine special-tests and almost an hour of special stage time. The only third-placed Alessandro Battig defended his lead in the overall standings, but Blanjoue is already close to four points... "This weekend didn't go so well for me, I didn't feel so good on the loose ground and on the grass-tests. And on Sunday I also fell twice," admits the Kawasaki rider from Italy afterwards. All three drivers naturally also won their classes: Blanjoue the junior class E2/E3, Dubost the juniors E1 and Battig the 4-stroke class over 250 ccm. In the senior class, guest entrant and local hero Anders Eriksson won again: the former Enduro World Champion had spontaneously decided to participate in his home country just three weeks earlier. But for him it was the same procedure as before, he fought every stage and did his best to relegate the leader of the class, the Polish Sebastian Krywult, to second place. But this on can take it easy, because he remains in the lead of the championship. In the women's singles, Sanna Kärkkäinen from Finland was pressed by guest entrant Emilie Karlsson, but was able to win both days and extend her lead to 29 points ahead of Nina Klink from the Netherlands and Hanna Berzelius from Sweden. The nocturnal rain had done the track good and bound a lot of dust. Nevertheless, the tracks went deeper and deeper and exposed more and more stones and slippery roots. This made competition more demanding and difficult as the power of the drivers diminished. Those who were not really physically fit fell further and further back during the long day. In addition to the major motorcycle brands of KTM, Husqvarna, Yamaha and Honda, there are increasingly also the small manufacturers in the European Championship: Sherco competed nine times, TM and Beta four times each and GasGas and Kawasaki with one engine each. The final will take place from 14 to 16 September in Kielce, Poland, and will end with a classic launch motocross. The evening before, the Frenchman Thomas Dubost had already laid the foundation for his day's victory, with a narrow victory in the prologue: In the end, the KTM-rider was eight seconds ahead of Ronny Kytönen from Finland, who is also a junior, but in the 125cc class! Kytönen took second place in the very last special stage, where he managed to take eleven seconds off the Dubost countryman, Hugo Blanjoue: Thus the class winners of the three different junior classes were, all together on place 1-3 in the overall standings! Local hero Albin Elowson (also a junior) retired already after a crash in the lead in the first round. The best non-junior was the Italian Alessondro Battig, who has been leading the championship so far: The Kawasaki rider finished sixth overall and won the class of the four-strokes over 250 cc. Similarly his compatriot Maurizio Micheluz, who won the 250 cc twostroke-class and finally came eighth overall. In the women's singles, the Finn Sanna Kärkkäinen won again ahead of the two Swedes Emelie Karlsson and Hanna Berzelius. Among the seniors, the Swede Anders Eriksson won the day as guest entrant ahead of Sebastian Krywult from Poland, who continues to lead the championship. Eriksson, who lives in the Skövde region and runs a motocross school, had been world champion seven times between 1995 and 2003. With a total of 160 participants from 13 different countries, the parc ferme was filled with respectable numbers. The prologue the evening before was simply evaluated as the first special stage of the first day of driving and was actually so short that there were no evaluation advantages. But more than 1,000 spectators from the city of Skövde took the opportunity to take a close look at enduro sport. The main focus on Saturday was of course the crosstest on the ski slope, which was almost completely overlooked. From 10th to 12th of August, the competition will be held in Skövde/Sweden, where the third of a total of the four events from 2018 is scheduled. The paddock is centrally located, directly at the Arena Skövde. This is at the same time the place for the two timechecks - the teams do not have to organise an additional support outside. The three laps start daily from 9:00 a.m., with three special stages to be competed in each case: Two cross tests and a enduro tests, where the finish line is always right next to the starting aerea. First time ever in the European-Championship there will be held a prologue on Friday evening. More than 180 riders are competing in the different classes. In the overall-championship, the Italian Alessandro Battig currently leads by 14 points ahead of the French junior Hugo Blanjoue. But the KTM rider is highly motivated and prepared to take the lead from his rival Battig. The Swede Erik Appelqvist will not start. After a crash he is injured and in hospital. The guest entrant Anders Eriksson also has a home advantage: The seven-time (!) world champion lives in the region and now starts once in the senior class at the age of 45. For the riders, teams and fans of the Enduro, the local swimming pool has a special offer directly on site - but the swimming pool is more than just a pool, it is a complete fun pool. Despite the high temperatures and drought throughout Europe, the competition is not at risk. More than 150 drivers from 15 nations has signed in for teh Enduro European Championchip in Skövde. After his overall victory at the first round in his home country, the Italian Alessandro Battig spontaneously decided to compete in the other rounds of the European Championship too. Battig won his class, but in the overall classification the Kawasaki rider took the sixth place "only", but keept his lead in the championship. In the women's competition, the Dutch rider Nina Klink clinched her days victory in the first round: She was the only one to climb the difficult uphill in the special stage with almost no problems. Their rivals had to push and fight and lost so much time that the best oft hem got a quarter of an hour penalty time. This is not only the second round of the season in Bacau, Romania, this coming weekend, 19-20 May 2018, but also the second time that the European Enduro Championship will stop there. Already in 2014 the riders were guests in the northeastern part of Romania and had found there a demanding and well prepared enduro competition by the lokal X-cape-organisation for these two days. This year, a 50 km long track is planned, which will be passed four times a day. Two special stages each with four (cross-test) and seven kilometres (enduro test) length are integrated in it. The paddock and administration is once again on the modern Business and Exposition Centre CAeX on the western outskirts of the city. This time more than 100 participants are already registered and of course none of the favourites can miss this race. One of these favourites is the only 19-year-old Italian Lorenzo Macoritto, who had already finished the first race in second position overall. However, the Husqvarna rider may have had some home advantage in Fabriano, Italy. But Junior has to convince abroad now. 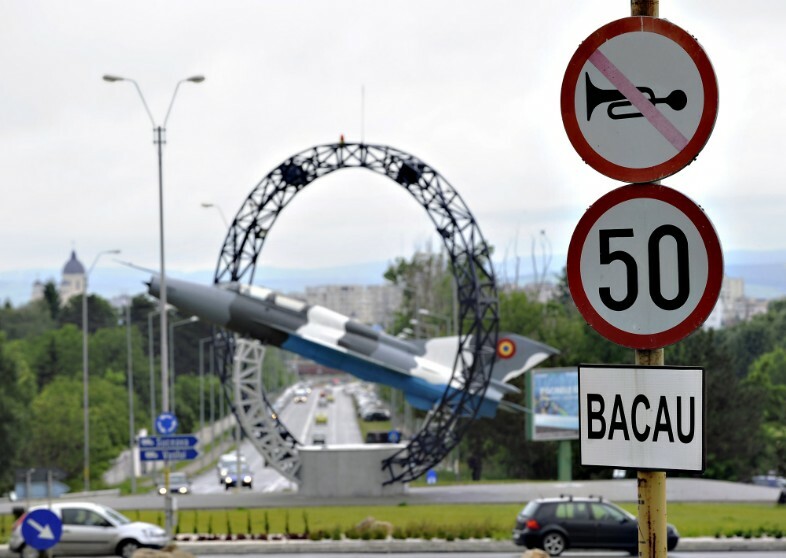 His 35-year-old compatriot Maurizio Micheluz, however, who had already been European champion, has a lot of international experience - spicily exactly in the year in which the European Championship round had already been in Bacau. Not only the constellation of old against young promises tension, but also the question of how the other nations will fight for the crown. Again his countryman Maurizio Micheluz was a little time the fastest, but then, this Husqvarna-rider made himself some mistakes in the following enduro-test and finished only fourth behind his team-member Matteo Pavoni, the reinging overal-champion, in the end of the day. 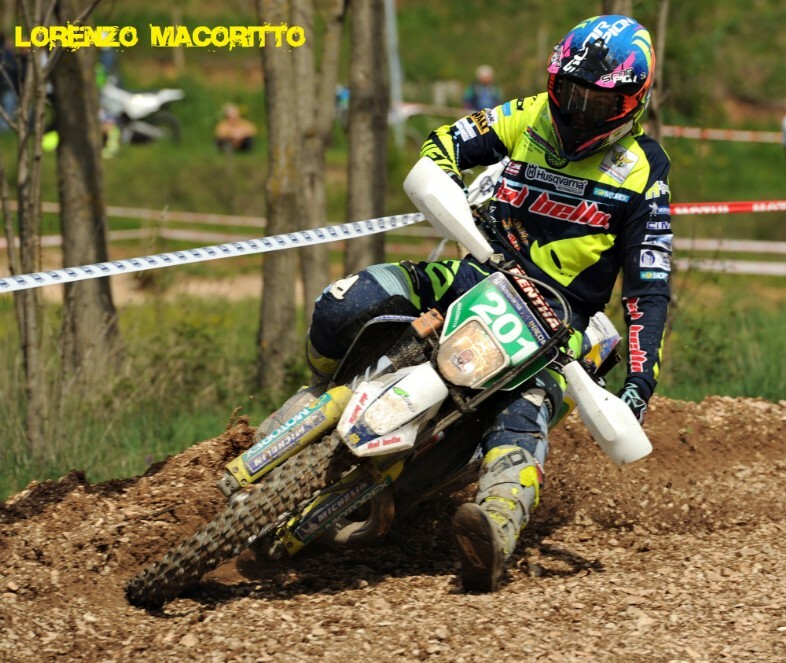 Second behind the winner Battig became a new young gun: Lorenzo Macoritto, starting in the juniors-class „E2/E3“ with the big Husqvarna 2-stroke-bike. Best „non-italian“ was the french Hugo Blanjoue on fifth position. The Junior was on second position in his class behind Macoritto. In the seniors-class the polish rider Sebastian Krywult on the KTM won both days and is now leading in the championship. In the women-class the former champion Sanna Kärkkainen from Finland ist back. She won the second day too, while the Dutch Nina Klink got used to her 4-stroke-bike and became second. All the years Klink was racing with 2-stroke-bikes and this was her first competition with her news 350cc 4-stroke-KTM. At the youngest Juniors the only 18 year old Claudio Spanu took the win both days: As Macoritto he is supportet from the italian federatione FMI. The new season of the European Championship started right this Saturday, the 14th of April 2018, in Fabriano / Italy (200 km north of Rome). And the first winner in this competition has been an Italian rider too! It was a continuation of the italian championship – last years overall champion Matteo Pavoni was fighting against his countrymen Maurizio Micheluz and Alessandro Battig. In the beginning not so strong, Pavoni increased in the last five from twelve specialtests – but Micheluz and Battig has been to far away, he could not reach. Battig was riding this year a 450cc Kawasaki instead of the smaler 250cc from last seasons: This helped him to win the overall at this first day in Fabriano and the first day of this seasons championship. Micheluz became second overall and won the new 250-2-Stroke class, while the former Junior Pavoni was third overall and won the over 250 cc 2-stroke class. Fourth position in the overall was to an Italian too: with this Lorenzo Macoritto did winn the junior-class with the big bikes over 250 cc. While the man had to do four laps with each 65 km, the women had to ride only three: Former (2015) Champion of women-class, Sanna Kärkkäinen from Finland, won at the least. „But it was quite hard sometimes: I have had to overtake so many riders, because I was starting so late,“ she commented in the evening. But next competition she will have a better starting-position, because of her championship-points. Ab big number of scandinavian rider had been coming to the kick of the championship. But most oft hem had no chance for training at home, with still ice and snow from Finland over Sweden to Norway. For the second day, the Sunday, the jury cut the distance for all riders to 3 laps, because of the weather forecast. 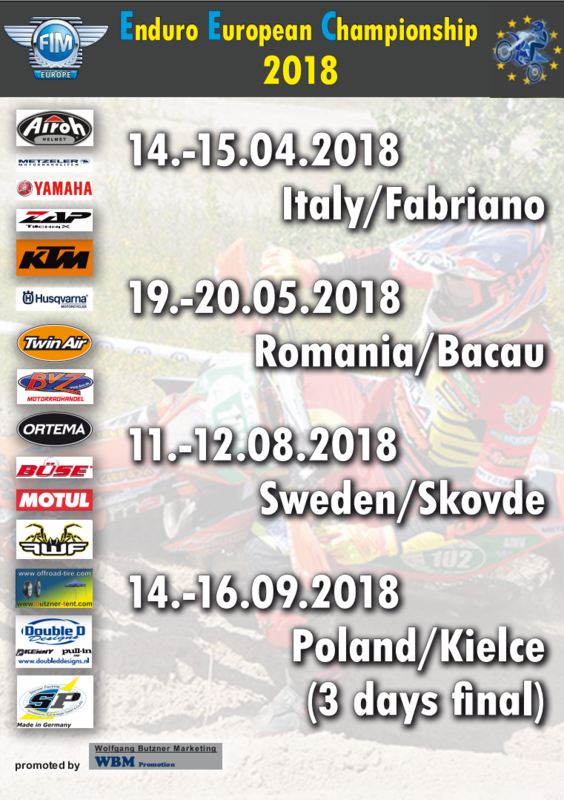 This weekend (14th and 15th of April 2018) the FIM Europe Enduro-Championship is going to start in Fabriano / Italy. With more than 25 riders in the „under 21 year“-class the European Championship proves once again as a real start for young talents. The link for Liftiming is online now! In case of bad weather condition, there will some cutting. Time remain the same. The Cross and Enduro Test have been marked with different colours of tape. There will be a total of 2 Time checks with service and refuelling per lap. N. 1 Route checks/ transit inspect along the course will be set. Also one Pre Finish will be organized at the end of Day 1. It will be situated just before the entrance of the paddock (Fabriano - Palaguerrieri). In accordance with the report of Chief Medical Steward. preliminary operation and park fermé. OFFICIALS, ACCORDING TO THE LIST. FICR Time Keeping team, 2 separate timekeeping system: transponders and fotocell. Parc Fermè will be situated inside the paddock area. Access to Parc Fermè will be made trough the gate that will be opened facing the Technical Control. Exit of the PF will be made trough one gate, opening facing TC 1/Start. Parc Fermè will be supervised according FIME Rulebook. Located just 200 mt near the headquarters of “Palaguerrieri”. Located in the headquarters, inside the Paddock – Palaguerrieri. Together with the Fim Europe Enduro Championship will be also one REGIONAL (for Italian only) event. In the 125-class for the youngest riders, the age has been increased to 21 years. In the normal junior-classes, which are up to 23 years, the two engine capacity classes as last year. Remained are the "seniors" and "ladies". Completely new is the electric bike class: Here one does not (yet) fight for a title in the European Championship, but the FIM Europe would like to keep the door open for upcoming developments. The number of special stages, the route and the length is completely up to the organizer. The starting signal for the new season will be on April 14th 2018: Then there will be three laps over sixty kilometers through the grounds and with three different special-tests every lap. 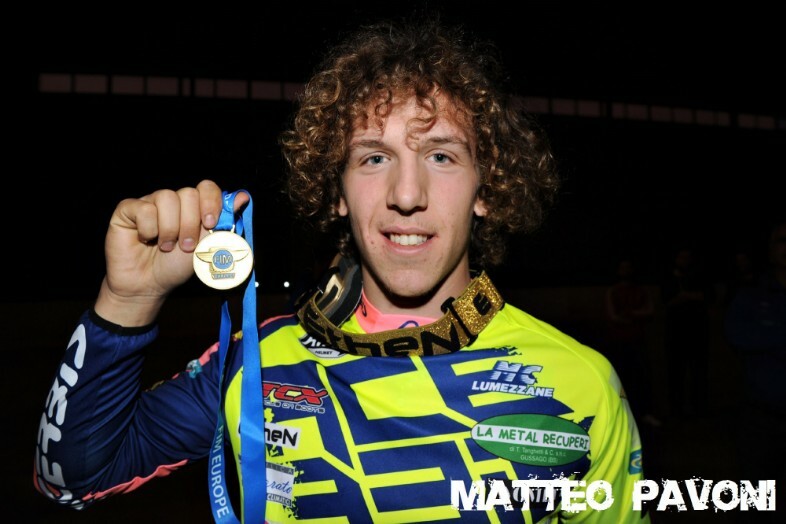 Last year overall champion, the italian KTM-rider Matteo Pavoni will be there to defend his title: Last year still riding in the junior class with the small displacement, the Italian is on the KTM in the class E2 / E3 with the big displacement in Fabriano. He is the big favorite this weekend. With 18 registered women, the ladies' class is more represented than ever!